This easy to follow gluten free sponge cake recipe makes the tastiest sponge cake, which just happens to be gluten free. This gluten free sponge cake recipe is a fantastic standard recipe. Make it as an every-day treat or as a celebration cake. 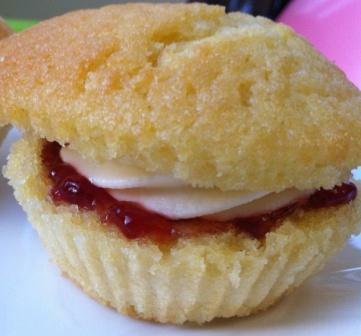 Use it to make a traditional Victoria Sponge cake (filled with jam and butter icing) or as little individual cupcakes whose decoration is only limited by your imagination. 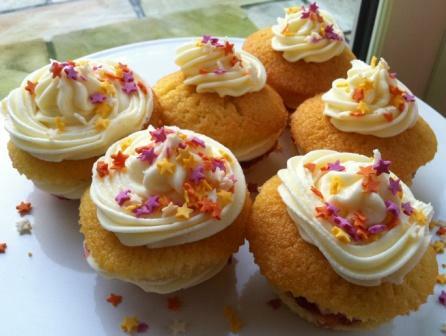 The photograph shows this recipe made into small individual Victoria sponge cakes. 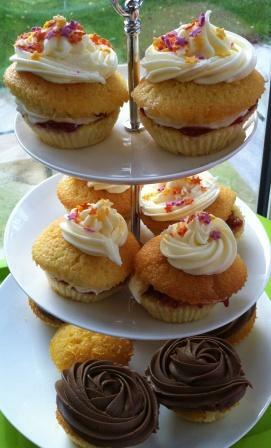 The smaller cake quantity will make between 8 to 10 small cakes. This simple recipe is easy to follow and includes different decoration tips which you can find at the bottom of this page. There are also notes on how to adapt it to be lactose free. It is great fun to make with children and there is no greater joy than watching a child who needs gluten free food being able to make and eat cake like all their friends. When making gluten free recipes following a few simple rules will ensure your gluten free sponge cake stays gluten free, we have some easy to follow tips on our Avoiding Gluten page. These quantities will make a large 8” cake. To make a smaller cake you can simply halve these quantities. For example use 5 oz (150g) of butter, 5 oz (150g) sugar, 3 eggs etc. ** To make a lactose free cake, replace the milk with cold black tea or natural fruit juice. Note that if you use fruit juice this could flavour the cake. Line cake tin with baking parchment or grease bottom and sides of cake tin with extra butter/vegetable spread*. If you are making small individual cakes, place cake cases on a bun pan or muffin pan baking tray. Add 3 eggs and half the sieved flour to the sugar and butter mixture and mix well. Add the remaining eggs and flour and mix well making sure all the ingredients are blended together. Add small quantity of milk** enough to make the mixture sloppy but not so much that it starts to separate. If it does separate simply add a little bit more flour until it comes together again. Bake for 50 minutes for one cake, 20 minutes if you are making small cakes. Test the cake(s) with a cake tester. The cake is ready when the top is firm to the touch and the tester comes out clean. The cooking time can vary for different ovens. For a single cake - carefully remove the cake from the tin and cool on a cooling tray. For small cakes – carefully lift the cakes, in their cases, onto a cooling tray to cool. Add it to the butter/vegetable spread* a little at a time until all the icing sugar have been added and it is thoroughly mixed. If the consistency is too thick you can loosen it by adding a little milk**. Cut the cake(s) in half horizontally. 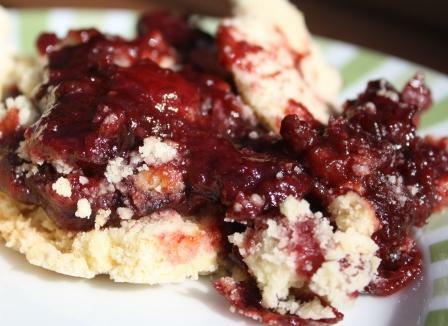 Spread the jam onto one of the cut sides and pipe or spread the butter icing onto the other cut side. Sandwich the cake(s) back together again. Dust the top with sieved icing sugar (optional). Decorate the top with water icing. You can add food colouring to some of the water icing to add colour. You can also use butter icing to add designs to your cake. 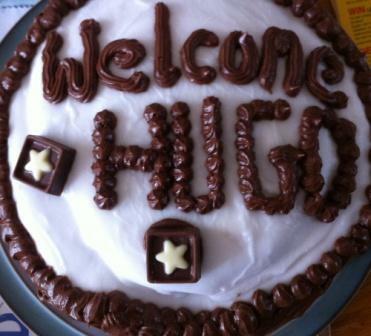 We have added cocoa to our butter icing used on this cake and piped a warm welcome for a new born baby. Make additional butter icing and pipe it onto the top of your cakes. Alternatively replace the jam filling with fresh fruit and decorate the top with whipped cream and prices of fruit. Mix (sieved) icing sugar and cold water to make the quantity and consistency of icing you need. Using lemon juice rather than water will give your cakes a zingy lemon flavour.